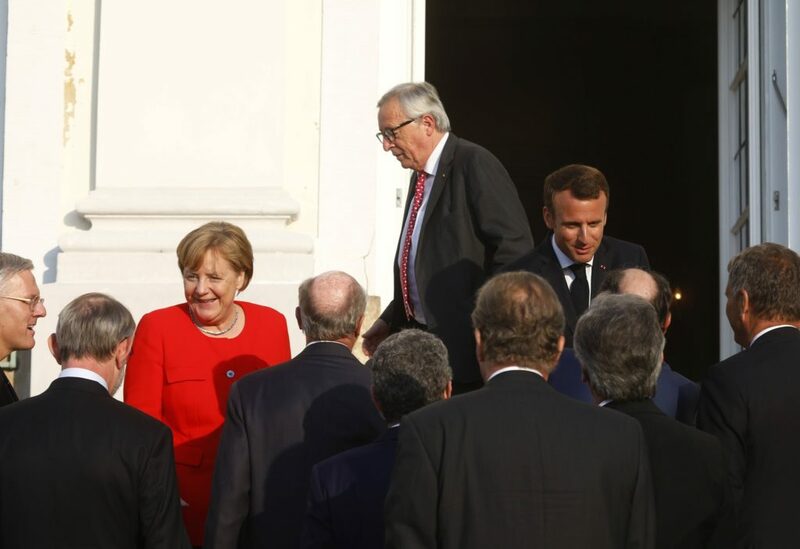 BERLIN — It was supposed to be the day when President Emmanuel Macron of France received a long-awaited response from Germany on his big ideas on how to rekindle Europe as a force for liberalism in the world. But his meeting with Chancellor Angela Merkel of Germany on Tuesday was overshadowed by the urgent issue of how to put out the growing number of populist fires over migration on the Continent — including in Germany itself. Ms. Merkel, faced with a rebellion by Bavarian conservatives that nearly brought down her government on Monday, is staring at a 10-day deadline to reach the kind of European accord on limiting migration that has eluded the European Union for many years. On Tuesday she came one small step closer. When Mr. Macron was asked whether he would take back asylum seekers who were first registered in France if Germany refused them at the border, as demanded by the Bavarians, Mr. Macron obligingly said he would. “I confirm,” he said. France would be obligated to do so under the bloc’s current regulations, but they have proved hollow as Europe has been confronted with millions of migrants and refugees from war-torn Syria, Libya, northern Africa and Afghanistan in recent years. More than 200,000 migrants sought asylum in Germany last year, and it is on pace to receive as many requests this year, according to Germany’s Federal Office for Migration and Refugees. In 2016, more than 700,000 migrants and refugees asked for asylum in Germany. Ms. Merkel’s coalition party in Bavaria would like to send back any asylum seeker who has first registered in another European country. But that would mean creating a border in the border-free Schengen zone, which Ms. Merkel thinks would mean the breakdown of free travel, a jewel in the European crown. In part because Ms. Merkel needs French support in her effort to find a new European consensus on how to address migration, she reached several agreements with Mr. Macron on Tuesday. Ms. Merkel agreed to a joint budget for the countries that share the euro, which would be separate from the larger European Union budget and would be established as soon as 2021. She also assented to a European reinsurance arrangement for unemployment. Both measures were once unthinkable for Ms. Merkel’s fiscally conservative country. Their meeting at the Meseberg palace outside Berlin, which took place in advance of a European summit at the end of June, was intended to address broad European issues, but it was marked as well by each leader’s domestic political challenges. Mr. Macron, who had first laid out his ambitious plans for Europe last September in a rousing speech of 100 minutes at the Sorbonne, needed movement on his eurozone budget proposal from the German chancellor that he could sell at home. Ms. Merkel, in turn, needed support for fixing Europe’s fractured asylum and migration policies. “The Europe that we know is too slow, too weak, too ineffective,” Mr. Macron said in September, before reeling off a list of ambitious proposals. On Tuesday, Mr. Macron did not get nearly as much as he hoped for. He had lobbied for a budget of hundreds of millions of euros to be overseen by a European finance minister. German officials, long suspicious of anything that smacks of a transfer union, agreed finally to the idea of a eurozone budget, but in the tens of millions of euros and overseen by the European Commission. But Germany did agree to a proposal to coordinate its corporate tax rate with France and to an overhaul of the European Stability Mechanism, the eurozone’s bailout fund, which would expand its mission and allow it to provide emergency loans to countries in recession. On balance, Mr. Macron probably got a little more than he had expected, given Ms. Merkel’s current political predicament. “The domestic pressure Chancellor Merkel is currently under makes it easier for the French President to get more money for the new budget,” said Thomas Jäger, a professor at the University of Cologne. If she is unable to reach agreements with other European countries within about two weeks, her interior minister, Horst Seehofer, has threatened to act unilaterally, turning back any migrant to Bavaria whose asylum process is pending in another European Union country. Under these circumstances, analysts said, the leaders’ joint declaration, which also covered support for closer military cooperation and foreign policy, was more substantive than might have been expected. The agreement “is an important step in the right direction,” said Marcel Fratzscher, head of the German Institute for Economic Research, though he added that it would not be sufficient to make the eurozone sustainable and to avoid future crises. On migration, the current crisis appears to have focused minds. “The topic that worries us all at the moment is migration,” Ms. Merkel said, standing beside Mr. Macron at a lengthy joint news conference after their meeting. Both Ms. Merkel and Mr. Macron hope to fashion deals with the front-line countries receiving the most migrants, like Italy or Spain, similar to one reached with Turkey. They also want to create a larger and more efficient European border force, adding 10,000 officers, and hope to discuss ways of processing asylum claims in North Africa, notably Libya, before migrants can arrive in Europe. Once migrants are on the Continent, it has proved very difficult to send back those who do not qualify as refugees, especially since many destroy their documents at sea. Following a tumultuous few days, with President Trump joining the fray in Europe by firing off hostile tweets and banding together with nativists from Hungary to Slovenia, Ms. Merkel’s meeting with Mr. Macron felt at times like a defiant counter summit — an attempt by Europe’s two main centrist leaders to close ranks. Mr. Macron, who has emerged as Europe’s most energetic leader, has made an urgent case for a liberal Europe. On Tuesday his government’s spokesman responded sharply to President Trump’s tweets by criticizing American policies toward migrants. “President Donald Trump’s policy of separating migrants entering the U.S. from Mexico from their children shows that the United States and Europe do not share the same ‘model of civilization,’” said the spokesman, Benjamin Griveaux. “If everyone retreats behind their national borders, we won’t succeed,” he said. The question is how much support Mr. Macron and Ms. Merkel command elsewhere in Europe for their proposed reforms of the eurozone and migration. Some nations, including Austria and the Netherlands, do not favor a separate eurozone budget, while Italy, with a new populist government, has vowed to get tough on migration. Katrin Bennhold reported from Berlin and Steven Erlanger from Brussels. Melissa Eddy contributed reporting from Berlin.